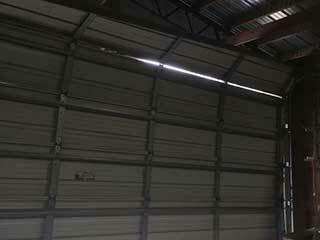 Obviously, a garage door that makes a lot of noise while it's moving can be incredibly annoying. When you leave home to go to work in the morning and your kids are still asleep, it can be more than annoying; it can be a real problem. It might even disturb the neighbors, and you wouldn't want that, now would you? In that case, if your door starts making grinding or squeaking each time you use it, there are some things you should check to locate the source of the noise and eliminate it. There are a lot of screws and fasteners that keep your door secured to the walls and ceiling of your garage. As time passes, these components can become loose and will start to rattle each time the door goes up and down. This can also cause the tracks or any other part they're holding in place to start shaking and making noise as well. You can try to tighten them to see if that solves the problem. However, if your door keeps making noise, you could have a bigger issue on your hands. Other small components that can be noise sources are the hinges. When the panels move, they rotate, and if they aren't properly lubricated they will start squeaking. Of course, over time they will wear out, at which point stopping them from making noise will be much harder, and they will need to be replaced. If you inspect them and find any holes or dark spots, then their condition is too bad and you need to have them replaced. These two are what we call the "usual suspects" when it comes to a noisy garage door. both of them need to be lubricated on a regular basis in order to keep their performance smooth and, most importantly, silent. You should examine them to make sure that they haven't worn past the point of being useful. If you don't find evidence of serious wear and tear damage, lubricate them and then open and close your door a few times to make sure the lubricant gets everywhere. If the problem persists, there could be a bigger issue, and you need to let our team take a look. Spring replacement is no simple task, and it must only be carried out by professionals. Our team at Garage Door Repair Kaysville will be happy to help you however way we can.